Wow! You are a painting machine! These Saxons are terrific and will soon be plentiful enough to fill up a gaming table. I started my Napoleonic Saxon Infantry project during July and managed to paint 4 Infantry Regiments (8 Battalions) plus the 4 Grenadiers Battalions. 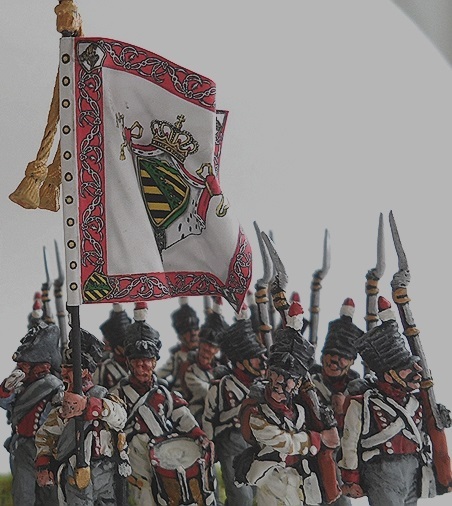 Completing 12 Napoleonic battalions in less than two months is incredible productivity in my book! I am amazed the work you put into your figures and projects. Also you are one of few hobbyists that I know of who can write great articles of the written word, of their work...where as I'm lousy typing descriptions of my painted miniatures, anyway.. really enjoy reading your blog posts/articles - Awesome! More beautiful troops in white, Phil. Those standards really pop too. One of the most beautiful uniforms of the period to my opinion...and your job is awesome! Thank you Phil! much appreciated! :o) yeah, Saxons had a reputation defecting/abandoning their allies during the Napoleonic Wars..
Great Saxons, love all that white, i wish i could produce painted figures as fast as you! Thanks Chris!.... Don't you dare change your commitment and pace of painting your miniatures. I would rather have your "patience" painting miniatures Chris ;o) than my raw aggressive approach :o) painting figures. Simply amazing, All that white just beautiful. Very inspiring ! Thank you Joe! I notice you have been a little quite with your blog activity - busy with work, real life etc. I guess? This project is coming together beautifully. I hope you'll do a group shot at the end. Hi there Lawrence, yes indeed planning on doing brigade photo shots of the figures/regiments and one day photos of the Saxon division arrayed...long way to though, currently working on the Saxon Light Infantry.